Here is a photo update. The weather has been unusually calm (and still) and there are signs of it being a warm water year. 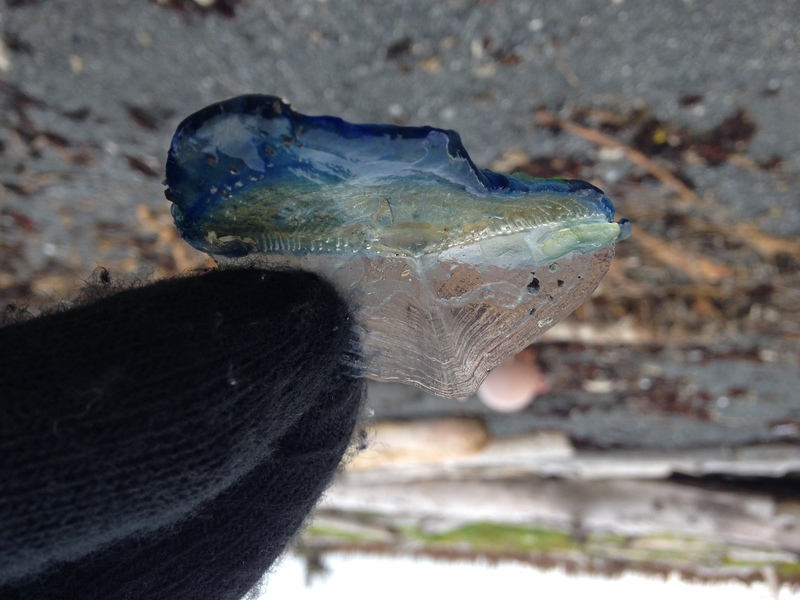 Beach finds include our first Velella velella and Cassin’s Auklet on the Island. Velella velella jellies have been turned up at Middleton Island this summer, too. 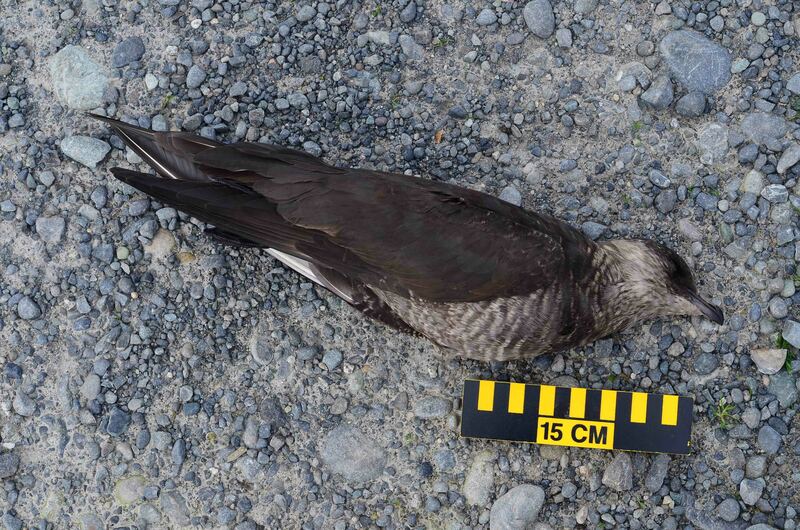 Cassin’s Auklet’s Auklet (COASST guide AL8-AL9 or AK: AL21-AL22) found on Middleton Island by Charlie. Note the short, stout bill with pale spot at base, and in fresh birds, blue-toned feet. 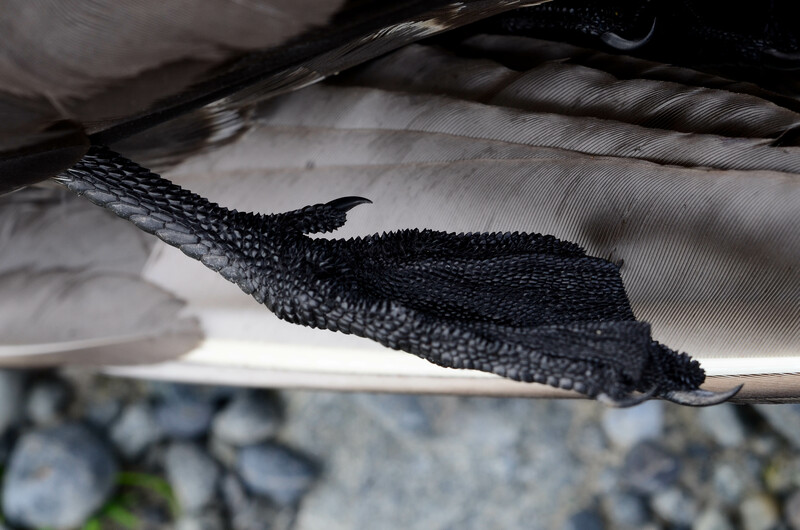 Also see the VERY COOL “armored” tarsus, toes and webbing of a Parasitic Jaeger. Parasitic Jaeger foot showing very rough (almost sharp) scales. Work days have been long and productive, and “days off” are spent doing much of the same thing. 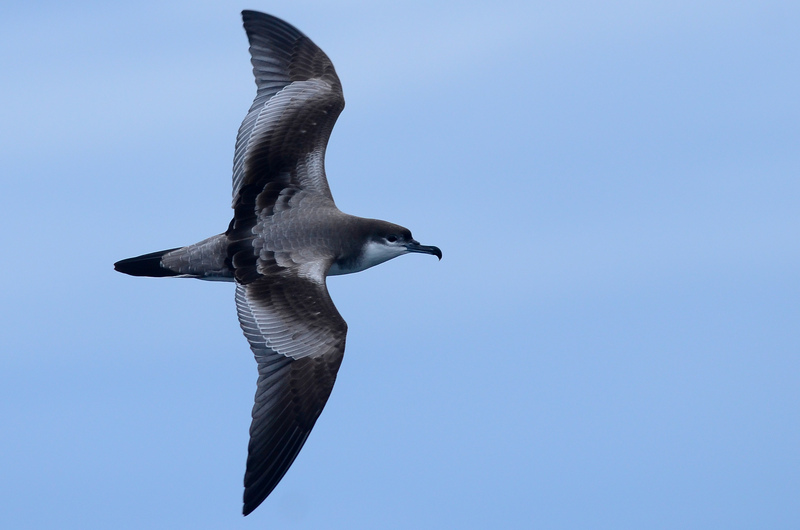 Charlie’s team, conducting shore-based surveys of pelagic birds. What are they seeing through those scopes? Look below! “The catch,” of Middleton Island’s fall banding station (one bird per bag). 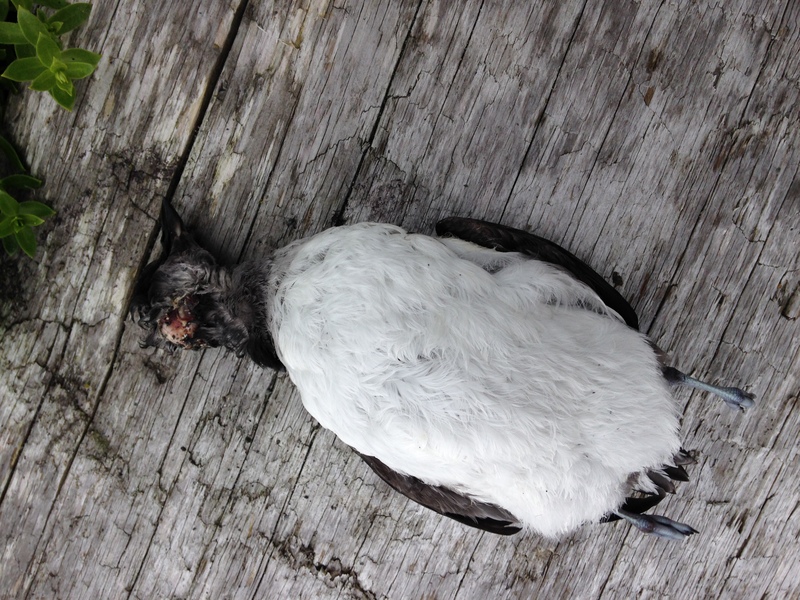 This entry was posted in Uncategorized and tagged Alaska, Invertebrates, Larids, Marine Mammal, Seabird, Tubenoses on September 24, 2014 by coasst. Helen and Peter’s BIG find! A cluster of squid eggs on Haskin Park beach (near Pacific Beach, WA). At COASST, we’ve had squid on the brain ever since we were introduced to Scarlett Arbuckle, who earned her PhD at Texas A & M looking at Ommastrephid squid, Dosidicus gigas. Now, Scarlett is a new member of Selina Heppell’s lab at the University of Oregon, home to a wealth of projects, among them the northward invasion of Humboldt Squid in the Pacific Ocean (check back soon, for our upcoming blog on Selina). More to come? Yes, definitely. We’re hoping to work with Scarlett to figure out what kinds of data COASSTers can collect on beached squid to inform researchers. Stay tuned! This entry was posted in Uncategorized and tagged Invertebrates, South Coast, Squid, Volunteer, Washington on July 30, 2013 by coasst. Krill, as viewed from a microscope. Credit: NOAA Fisheries. 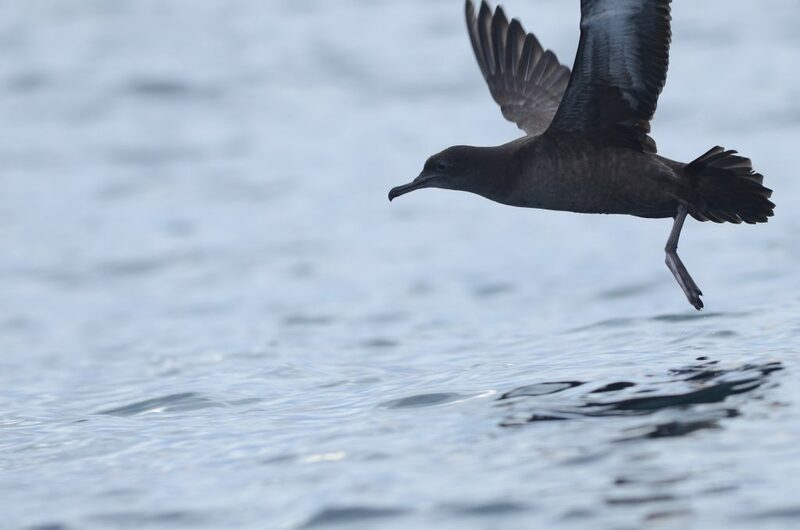 Since late June, Oregon and California COASSTers have been keeping their eyes out for large numbers of krill coming shore. 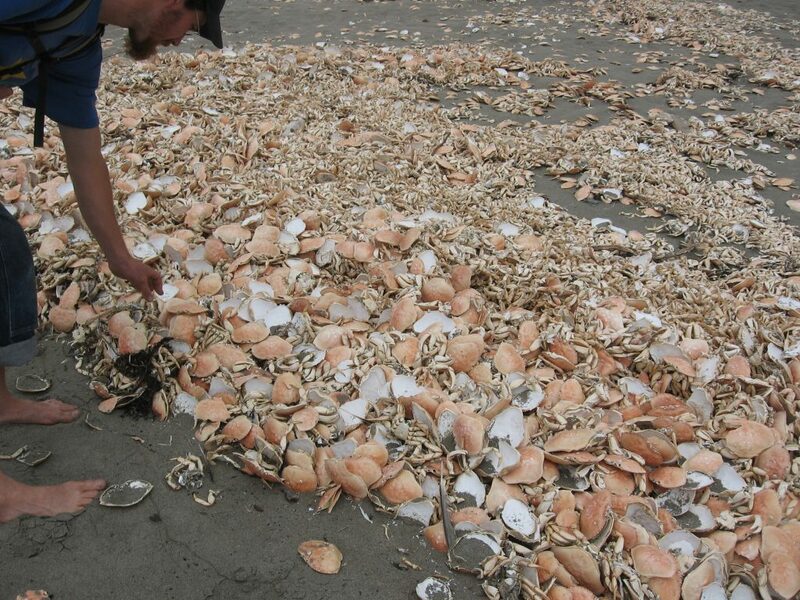 This puzzling phenomenon, mentioned in a previous post, has been happening on beaches from Bodega Bay, California to Newport, Oregon, and scientists are still unsure about the cause. 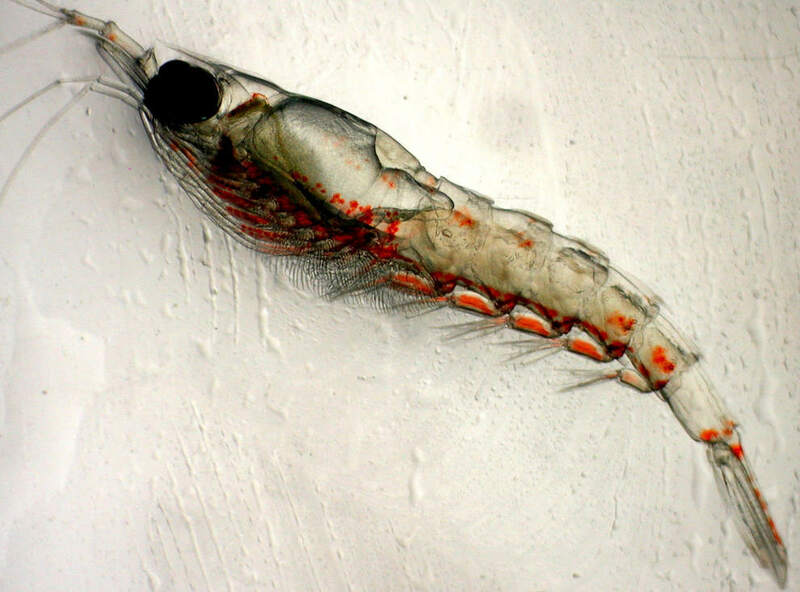 Speculated causes include a krill pathogen, or swarms of krill being carried off by the wind when they come to the surface to mate or to get more oxygen (possible hypoxia event?). 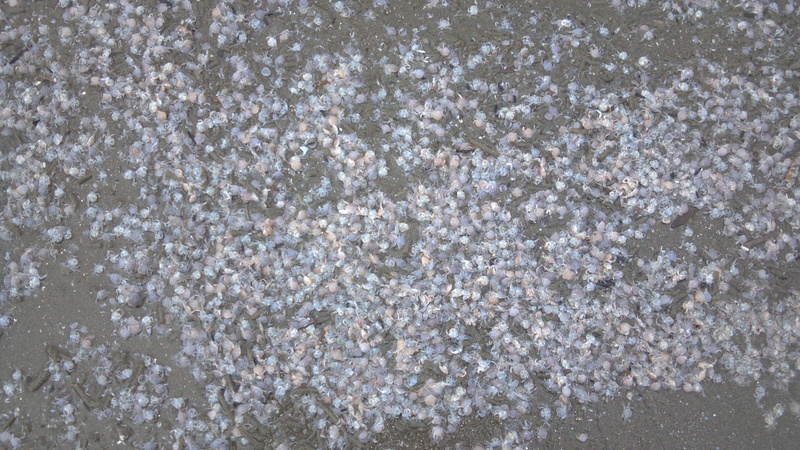 The first report of krill came on May 11, 2013 from Oregon Mile 99, Dave and Diane’s beach. Additional COASSTers from Agate Beach (Wendy), Oregon South Mile 101 (Doug and Mariann), Seven Devils (Karen), Bullards Beach (Rick), Ma-le’l (Sara and Peter), and Mad River Park North (Cindy) did not note krill during their late June COASST surveys. This entry was posted in Uncategorized and tagged Crabs, Invertebrates, Krill on July 16, 2013 by coasst. Krill – have you seen? Have you seen me? Small (~2cm), red-orange, 16 legs, big eyes. Thanks to Gary Lester (Humboldt COASSTer), Amber Transou (Redwood State and National Parks) and Bill Peterson (NOAA) for alerting us to a sporadic series of krill beaching events from central Oregon to northern California. If your survey beach is between Newport, Oregon and Eureka, California, and you were out during Father’s Day weekend (June 15/16) or before, let us know – have you seen krill? 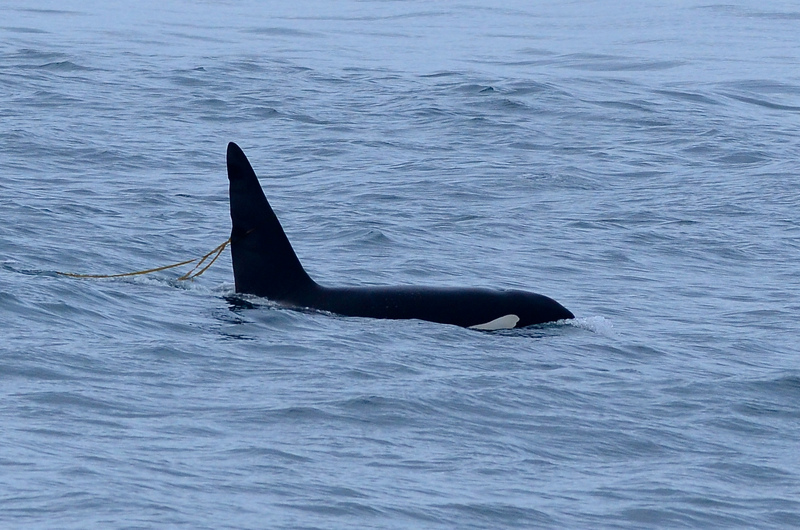 Our earliest reports come from Dave and Diane, on Oregon Mile 99, near Bandon, May 11, 2013. 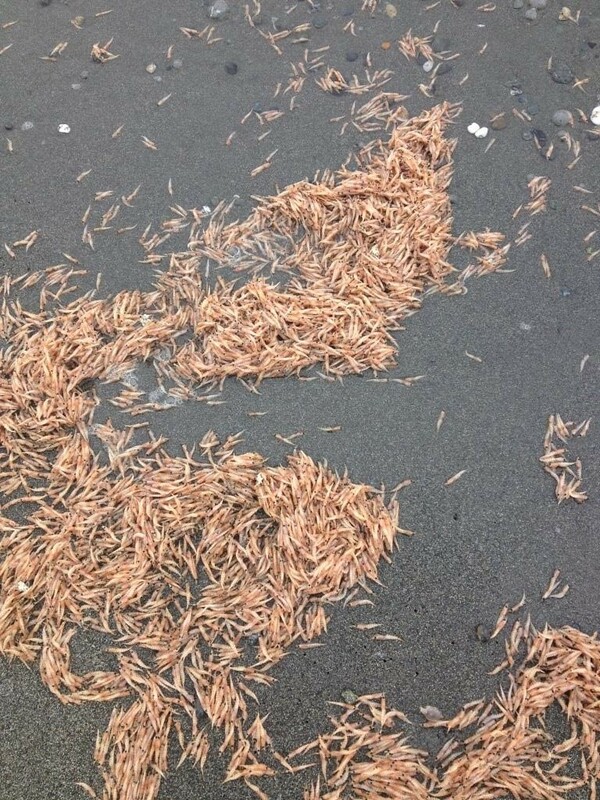 Krill on Gold Bluffs Beach, Humboldt, California. Credit: Amber Transou, California State Parks, North Coast Redwoods. 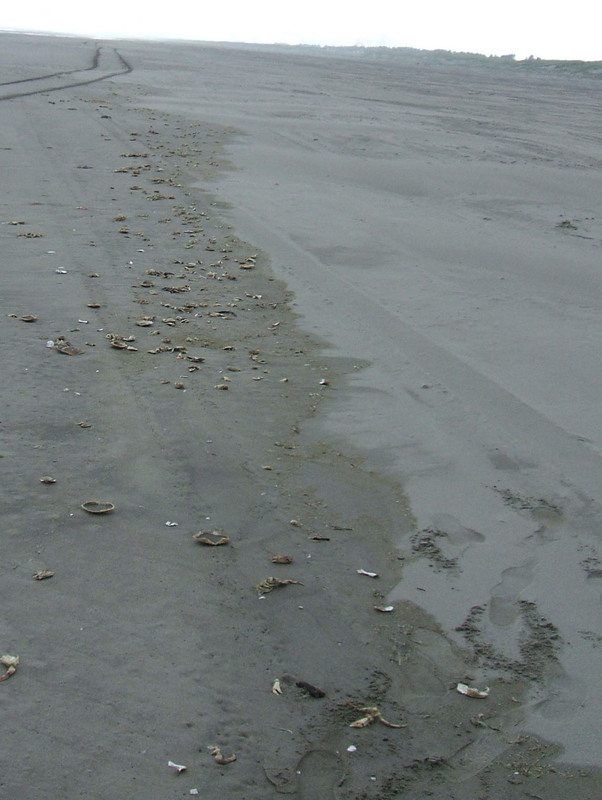 Some COASSTers have replied to mention an absence of krill, but lots of first and second year “instars,” or juvenile Dungeness crab (molts), washing ashore during the same time (see below). Tiny Dungeness crab instars on Clam Beach (CA), June 17, 2013. Thanks Linda, for the photo! This entry was posted in Uncategorized and tagged California, Crabs, Humboldt, Invertebrates, Oregon on July 2, 2013 by coasst. Long Beach Peninsula COASSTer Paul Watersrat reminded us we’re heading into “dungie season,” a time when COASST participants on the outer coasts of Washington, Oregon, and California can expect to find some (or lots of!) Dungeness Crab molts. At Paul’s beach, Ocean Park South, molts make up most of the wrack line. Dungeness Crabs begin as tiny, shrimp-like zooplankton, that live throughout the water column. At the onset of downwelling in the fall, ocean currents push larval crabs inshore, where the bigger, tail-less versions become important prey for larger predators like salmon. From there, the tiny crabs (looking much more crab-like now!) settle down in protected areas, hopefully out of site of snacking adult crabs. In the first two years of life, these tiny guys molt as many as six times per year. Adult females molt in the spring (now! 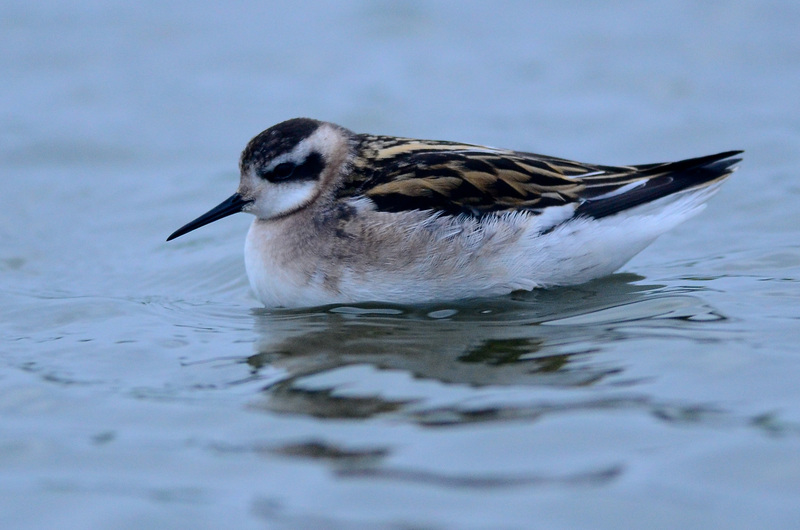 ), males in the late summer, usually all-at-one, which gives the impression of a big crab die-off. But make no mistake! These lightweight leftovers are either upper body shells only, or some combination of shells, legs gills, antennae, and mouthparts, but no guts. 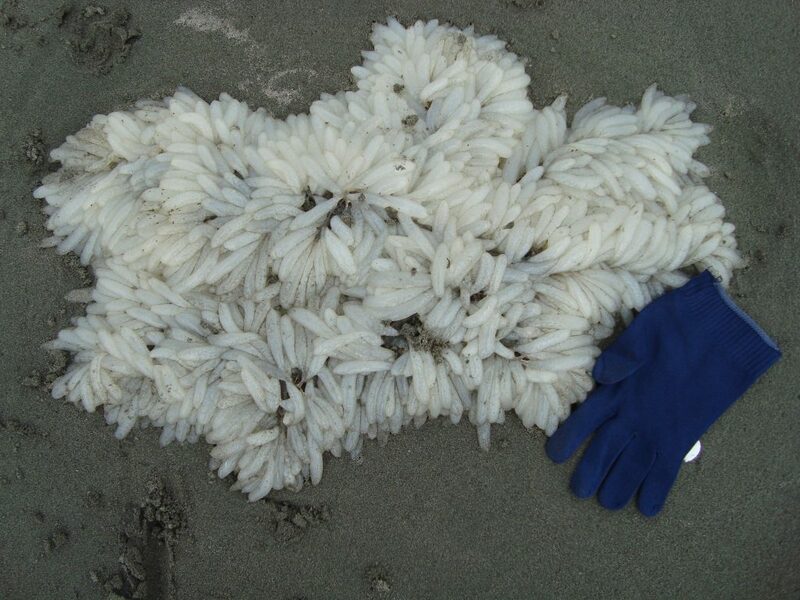 The most striking instance we’ve seen occurred on Shi Shi (northern Washington Coast) in July 2011, with thousands to tens-of-thousands of molts were found on a single beach. Seen something like this on your beach? Lay down your ruler and snap a photo – we’d love to see. Sue documented this molting event on Shi Shi in the summer of 2011. 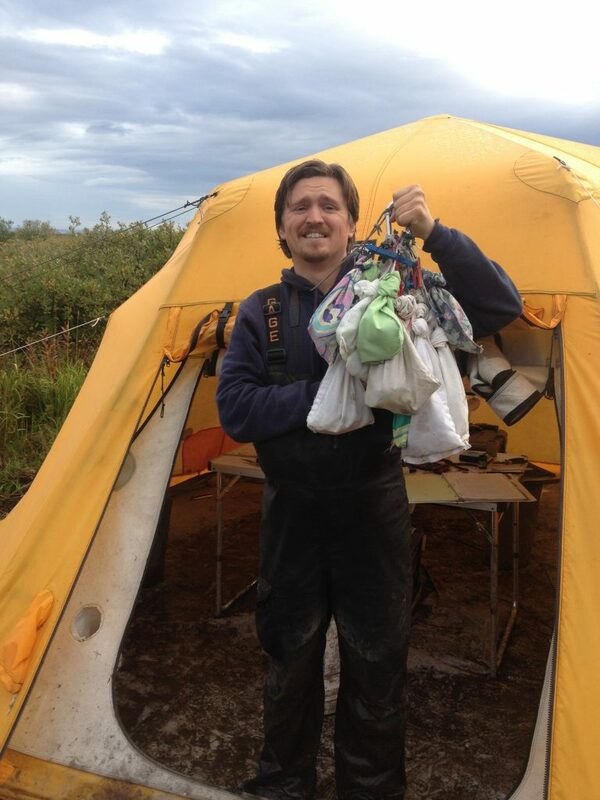 This entry was posted in Uncategorized and tagged Crabs, Invertebrates on May 27, 2013 by coasst.